Mix whites into steep foam, stirring add sugar and vanilla sugar. Mix sugar powder with starch and sift over white mass, stir gently. Add nuts and grated chocolate, stir gently. Heat the oven at 150℃. With the help of two tea spoons spread small balls on baking sheet, covered with baking paper. Bake for 20-25 min. Cool ready cookies down. Decorate as you wish. 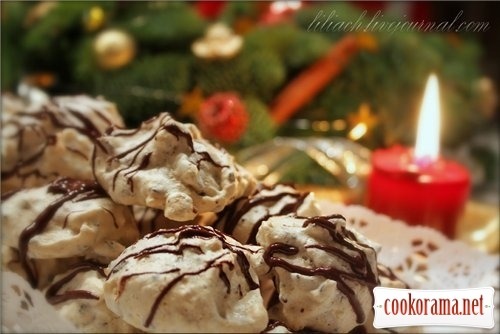 Top of recipe "Airy clouds - Stracciatella - Wolken"